After the disappointment of my 'red' MAC lipglass I was still desperate to find the perfect red lipgloss. It just so happened that this was around the time that Tanya Burr launched some new additions to her Tanya Burr Cosmetics lipgloss line, one of which was the limited edition lipgloss 'Mistletoe Kisses'. I've tried some of the nail polishes from Tanya Burr Cosmetics and I've been really impressed with them so I decided to give a lip gloss from the range a go. The lipgloss is a slight pink toned-red which has subtle flecks of gold shimmer running through it,making it a perfect shade for the festive season (the swatch looks slightly more pink on my photograph than it does in reality). Now there is a definite 'love it' or 'hate it' feature of this product and that's the smell and taste. The gloss has a very sweet strawberry like scent and taste, it almost reminds me of the lipglosses I used to wear when I first discovered make-up. This is not something I'm really a fan of when it comes to a lip product, but I'm sure others may like it. 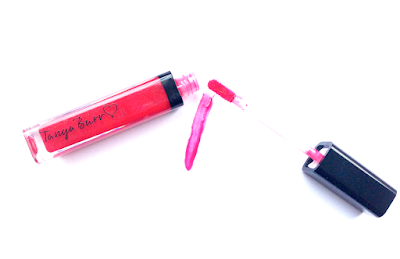 The lipgloss has a flexible applicator wand which makes for a precise application. The flexibility of the applicator also allows the product to be distributed evenly on the lips. The lipgloss formula is a little bit on the sticky side but nowhere near as much as other lipglosses I've used. Up to now I've managed to avoid any awkward 'hair stuck to the lipgloss' situations, so it' so far so good. When worn alone the lipgloss provides a subtle pop of shimmery red, which makes it perfect for everyday wear. But as I love to wear a bold red lip I have been wearing this lipgloss over the top of Makeup Revolution's Salvation Velvet Lip Lacquer in 'Keep Trying For You' and it looks stunning and has now become my current favourite look. I purchased Tanya Burr Cosmetics 'Mistletoe Kisses' lipgloss for £6.99 from Superdrug,unfortunately it appears to be out of stock there now but I've had a look elsewhere and it still appears to be available on Cloud10Beauty (psst it's currently on offer for £5.56 there too). What's your current favourite lip look?